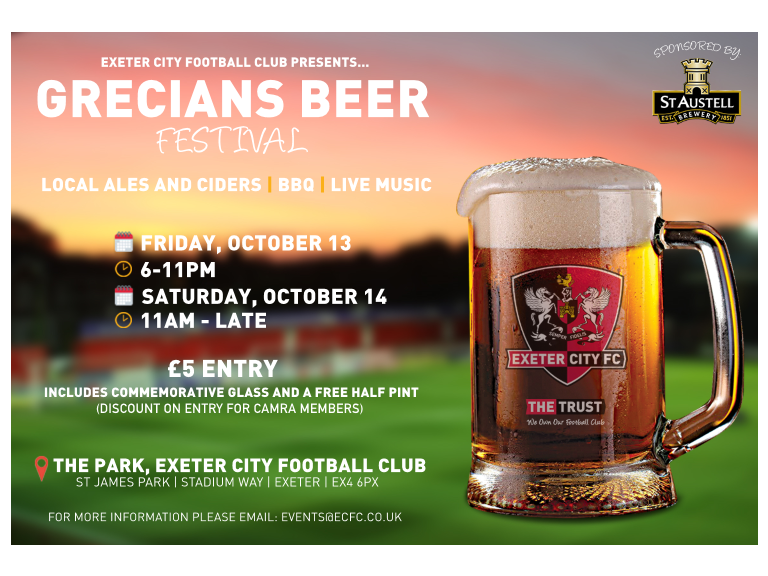 St James Park is the place to be on the weekend of October 13/14, as Exeter City host the Grecians Beer festival, in partnership with St Austell Brewery. The Park will play host not just to a mouth-watering array of ales and ciders, but there will also be fabulous food available from the resident BBQ. Admission is £5 which covers both days, a commemorative glass and a drinks voucher to sample some of the fine ales and ciders on offer. Live music will also be on offer on Friday evening for you to come and enjoy. Brit Pop Specialists Mad For It will be gracing the Centre Spot stage from 7.30pm, playing 90s Brit Pop covers from bands such as Oasis, Blur, Manic Street Preachers, Pulp and many more. These five talented musicians have perfected the capture of the era. The club have supported the band from their beginnings, by offering them rehearsal facilities on a regular basis and the band have kindly offered to repay the favour by giving us their time for the event. On Saturday the venue will be pure sport, showing the Liverpool vs Manchester United lunchtime kick-off, followed by Soccer Saturday, bringing you the latest on the Grecians away trip to Wycombe. The Watford vs Arsenal, 5:30pm kick-off will also be screened. The two-day event will offer a friendly atmosphere, great food and entertainment, and a fantastic day out for families and friends in the centre of Exeter - one not to miss. The club is delighted to be able to offer CAMRA members an exclusive discount on entry to the event. Contact to find out more. For more information or to book tickets in advance, please email: events@ecfc.co.uk or call 01392 413957.